IN A COLD snap like this, my mind and my cooking wanders to sun-drenched lands as the warm aromatic flavours of Greece and Lebanon make for perfect winter fodder. 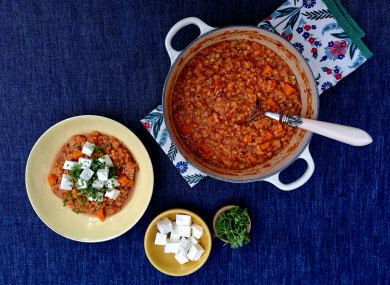 This Greek Lentil Stew has been my go-to comfort food for years – it’s quick, simple and cost very little to cobble together. I make a big batch on the first night and devour a bowlful, crumbled with feta and a hunk of crusty bread on the side. Then I pack the rest away to heat up for midweek for lunches or as a wholesome side for a meaty dinner. And speaking of meaty dinners, I love any meat dish that can be cooked in one go and used several ways during the week. My version of baked kibbeh does just that job. One of Lebanon’s treasured national dishes it’s usually made in shape of meatballs or patties but for this recipe, I bake it whole and then divide it up into portions. It reminds me of a posh meatloaf, dressed with sweet, caramelised onions and full of warm and earthy Middle Eastern spices. It tastes great straight from the oven gobbled down with a cucumber salad and a dollop of plain yoghurt, but then is just as good cold in a sandwich the next day. Try it in a toasted pita stuffed with spinach and hummus. Or the next day for dinner I pan fry it for a few minutes to heat it through and then add some rice and a crunchy salad. Or leftover lentil stew if I have some. Traditionally you should add bulgur wheat to the meat mix but it works just as well without it. Prepare your diced vegetables and garlic and heat a little oil in a large pan over a medium heat. Add your onions first and cook gently for 5 minutes, allowing them to soften but not to colour. Then add your carrot, celery and garlic. Stir and cook for a further 5 minutes. Add your lentils and stir to coat everything. Add your tomatoes and a pinch of sugar. If you’re not using diced tomatoes, then squash the whole ones with a potato masher as you add them. Add your oregano and thyme and/or any other sprigs of herbs you fancy. Add 1 tsp of chilli flakes for light heat and 2 tsps if you prefer it hotter. Season with salt and pepper, but be cautious – you’ll be serving it with salty feta with it later. Stir and then add your stock and water. Reduce the heat and cook, stirring occasionally for about 20 minutes or until the lentils are tender and the whole pot thickens. Chop some parsley and serve the stew with a pile of diced feta in the middle and a sprinkle of parsley and a tablespoon of vinegar on top. Trust me about the vinegar, it makes the dish! Preheat your oven to 180c. Grease a gratin dish or medium baking dish with some oil. In a bowl add your mince. Peel your onion but leave it whole and grate it into the bowl of mince. You don’t want bites of onion in kibbeh, just the taste, so it’s perfect minced like this. Add your cinnamon, cumin and allspice and some salt and pepper and then knead the mince mixture with your hands or wooden spoon for a few minutes so it starts to come together well. If you’re adding bulgur wheat, add it now and then mix again very well. Turn your mixture into the greased dish and spread it out evenly, flattening it with your knuckles. Then using a sharp knife cut the mixture into portions – I usually divide it by four. Put the meat into the oven for 20 minutes while you get your topping done. Heat some oil in a pan on a medium to low heat. Add the onions and cook them slowly until they start to soften and brown, about five to ten minutes. Add your pine nuts and cook for a few more minutes to allow them to colour. Finish with cinnamon and drizzle of honey and take off the heat. Take your kibbeh from the oven, it will probably have shrunk and come away from the edges as it cooked especially if you haven’t used bulgur. That’s OK. Just spoon the onion mixture on top and put it back in the oven for five minutes. When it’s ready, divide into portions and eat when warm with cucumber salad and yoghurt on the side. Email “Spice up your kitchen: Easy make-ahead dinners to keep you warm all week”. Feedback on “Spice up your kitchen: Easy make-ahead dinners to keep you warm all week”.